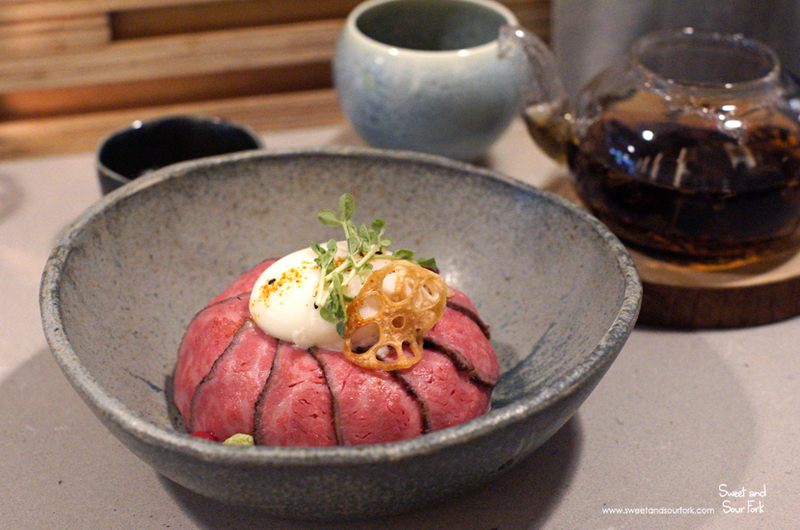 Juan Bowl and Tea has been on my hype-radar ever since I moved to Sydney last year and found almost everyone raving about their amazing rice bowl – don – and tea pairings. I waited a bit for the hype to die down (and to have a little more money in my pocket) and then BAM, I was there. Juan embodies the Japanese spirit of doing one thing, and doing it really, really right. 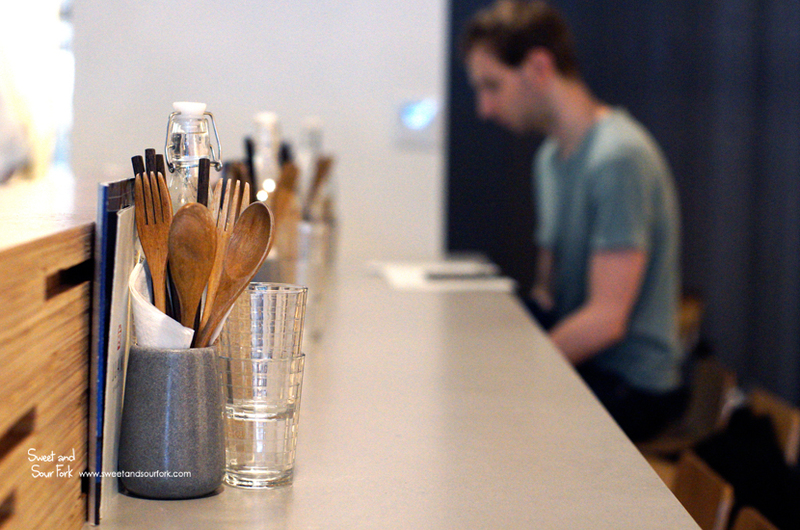 The whole focus of the restaurant is in the name – bowls of stuff on rice, and carefully curated teas to match. 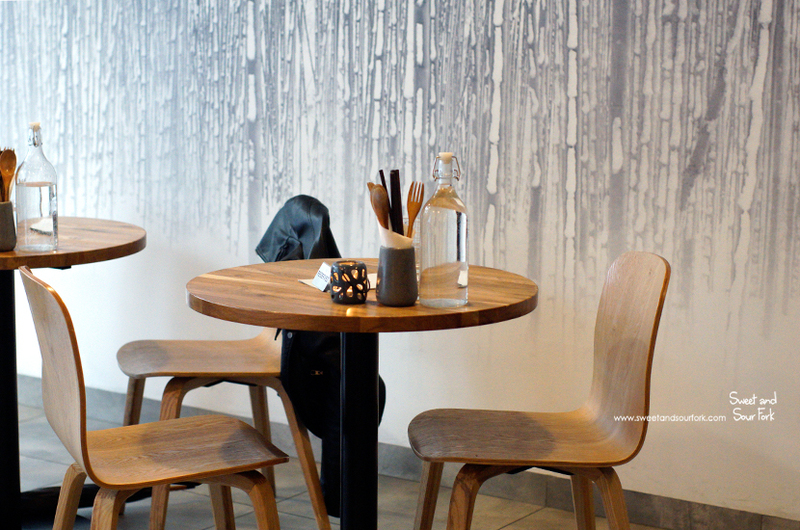 And despite the rather humble concept, the careful craftsmanship extends to beyond the food into the décor as well. With its dramatic down-lights, minimalist furniture, and bar-styled seating taking up the majority of the tiny space, Juan has more than a whiff of a high-end sushi bar. I’m not usually a fan of drink-pairing, but with the matched teas being such a big deal here – it’s in the restaurant name for goodness’ sake! – I felt like I should try at least one. 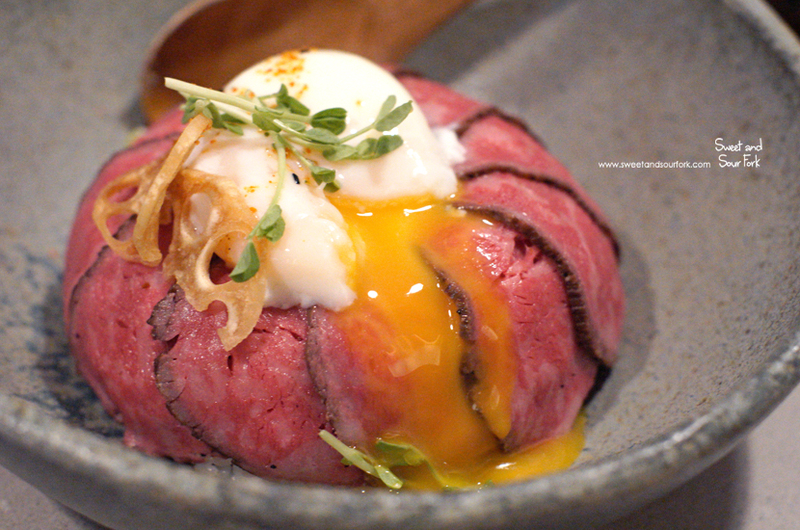 I ended up ordering the Jin Jun Mei ($8) to match the wagyu bowl. 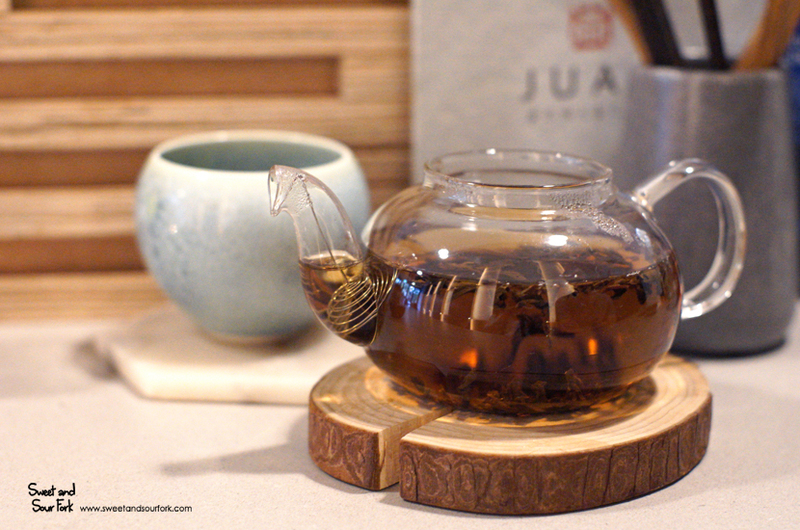 It was a dark, golden liquor with a woody smokiness reminiscent of oolong, but without any of the heaviness. It was a nice and slightly unusual tea, though I will admit I didn’t really ‘get’ the matching aspect of it. On the other hand, I actually got drink-envy from the girls next to us, who ordered the matching organic lemon myrtle tea for their tonkatsu bowls. The smell was super bright and refreshing, and would’ve been great for cutting through the richness of the pork. Anyway, back to the food. Despite only having 4 bowls on the menu, I actually had a remarkably hard time deciding what to order; according to all the reviews I’ve read, all the options are consistently delicious. In the end, I decided to stick with the more classic options, the first of which was the Wagyu ($24). And oh my, was the wagyu really something. 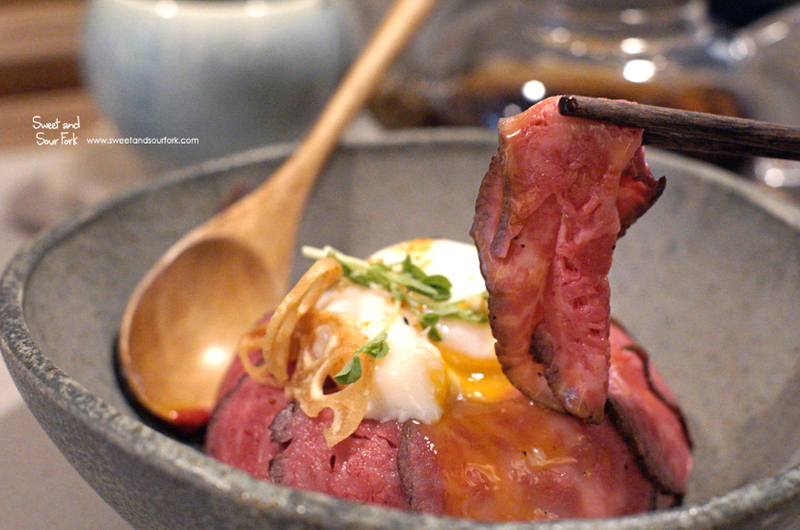 Seared ever so slightly, the heavily marbled beef was astoundingly buttery, especially with the addition of the runny onsen egg yolk. It’s not heavily flavoured, but that’s where the small cup of onion sauce comes in to add a deep savoury sweetness. I opted to tip the entire thing over the dish instead of dipping the slices of beef, so that the sauce was able to soak into the fluffy grains of rice as well. And although the beef was in very thin slices, the pieces were surprisingly large, and combined with the fattiness, I was definitely satisfied with the portion size by the end. I was enamoured with the Tonkatsu ($23) ever since I first laid eyes upon it, and knew I had to have it. But it wasn’t the pork that caught my eye – it was the omelette. And it tasted every bit as heavenly as I had imaged, so delicately silky and creamy, forming a sheath to cover the fluffy grains of onion jam-infused rice. But of course, the tonkatsu itself was no slouch. Slow-cooked for 2 hours before being carefully deep-fried in a batter that stayed crisp for the entire meal, the pork was tender, buttery, and rimmed with an indulgent layer of fat just below the crumbing. 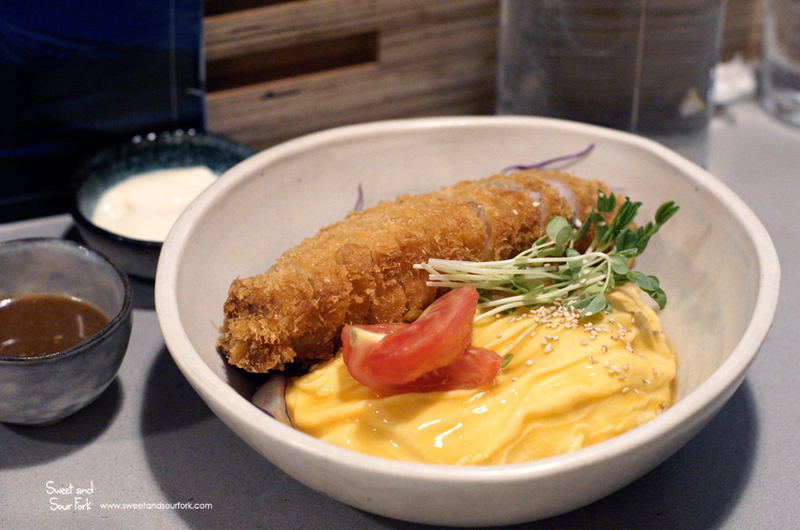 It was served with two dipping sauces on the side – a distinctly fruity apple mayo, and a surprisingly tangy sesame miso sauce that did wonders to balance out the richness of the meat. This was a monarch amongst pork cutlets. 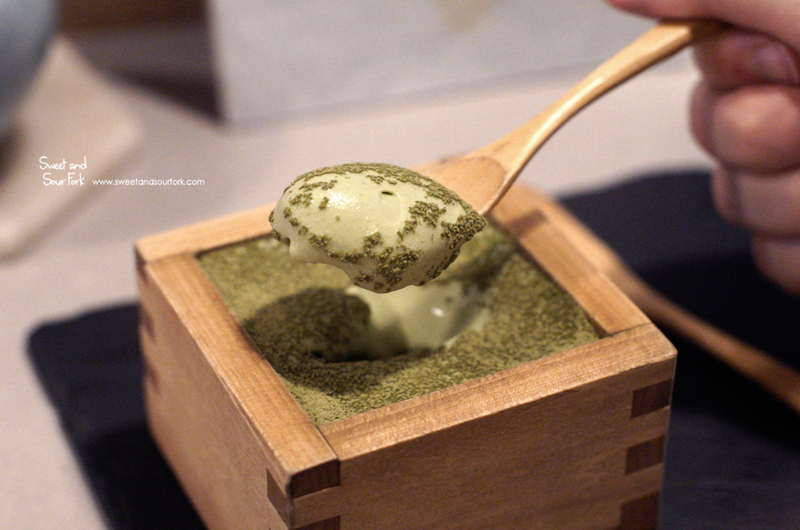 There were two desserts available on the day we went, but I had to try the signature Matcha Tiramisu ($12). This is one dish at Juan that has been unanimously raved about, and here’s the proof – Chris likes neither matcha nor tiramisu, yet his first bite garnered three consecutive “mmmmmm”s, followed immediately by regret that we didn’t order one each. This was absolute perfection in a cute little wooden box. 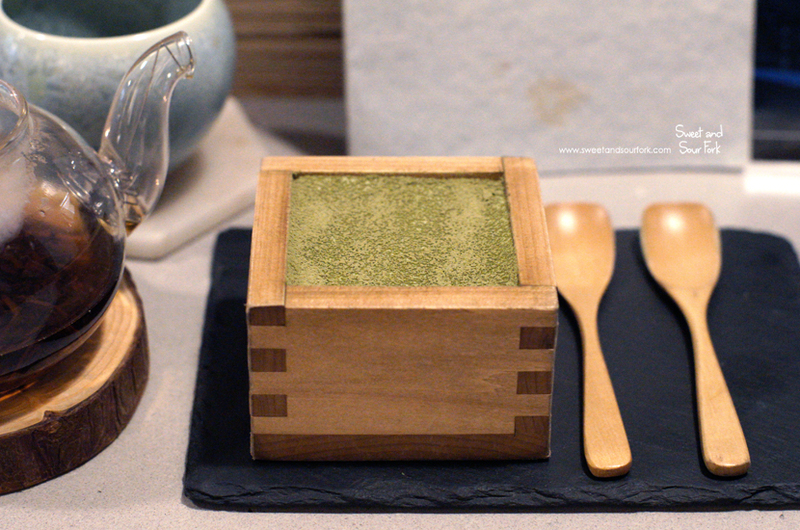 The top layer of matcha-infused cream was cool and milky, hiding a base of moist, sweet sponge. The matcha powder sprinkled on top gave it just a bit more oomph, and all up, it was just such an exquisite balance of flavours and textures. It really is hard to describe what makes it so good – it needs to be tried to really be understood! I’ll admit that I came into Juan feeling hopeful, but also a little bit jaded. I have been burned enough times by the hype train in the last year that I was a little bit dubious that something as simple as don and tea could rock my world like everyone seemed to be promising. As it turns out I was completely wrong in this case, but I’ve never been happier for it. Juan is every bit as good as the crowds have promised, and is a concept that is as unique as it is well-executed. I spent the next 2 days pining non-stop after Juan; it’s just as well that you need a booking to get into the tiny space, or I’d be there twice a week to the detriment of my wallet and waistline. Rating: 15.5/20 – the juan for me. my juan and only. juan-derful. etc etc.